Making your own TI-99/4A Video Cable . Now that you have that old TI up and running, you might wish to connect it directly to a television monitor without the use of the RF modulator. The problem has been finding the proper video cable to make this happen. Well fret no more, I have put together the instructions on how to make one yourself! It is very easy and all you need are a few tools and parts. So If you are ready, Lets go! 1. Cut the RCA connectors off of one end of the RCA cable. This will expose the wires for us to work with and leave a set of RCA connectors on the opposite end. 2. Strip 1/2 inch of the outer casing away, exposing the center conductor surrounded by the grounding conductors. 3. Cut away about half of the grounding conductors so as to decrease their quantity and enable us to fit them in the DIN plug. 4. Strip away about 1/4 inch of the insulation on the center conductor. 5. Repeat steps 2 to 4 on the other cable. 6. 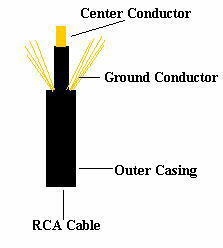 Tin the center conductors of both cables (apply a thin covering of solder to the. This will make it easier to join the conductors to the plug. 7. Twist the ground wires from both cables together and tin them also. 8. You should have three wires to work with, a ground and two center conductors. 9. Cut the tips of all the wires to make a clean and even connection. You must use caution when applying heat to the pins as the plastic holding the pin will melt if it gets too hot. 1. Apply a small amount of solder to the inside of pins 2, 3, and 4. 2. Heat pin-3 until the solder melts and insert one of the center conductors, remove the soldering iron and allow to cool. 1. Use an Ohm meter to test the continuity between the pin and the other end of the cable. If you do not get a reading, then one of the connections is bad. Check the connection and reapply solder if needed. 2. 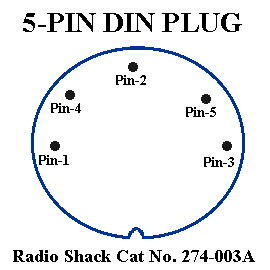 The things to check for are that you have continuity between the grounds on both RCA cables and pin-2 and that the center conductors have continuity from pins 3 and 4 to the respective RCA pins. You also want to ensure that none of the pins are shorting to any other pin. It disappeared from its original location and I am now hosting it here. If you are the original poster and object let me know and I'll remove it.